Ahoy scallywag! 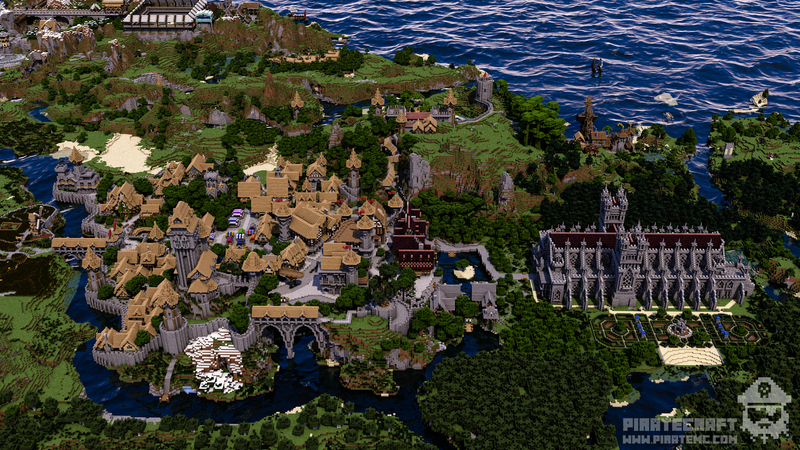 I’m proud to announce the PirateCraft marketplace, Doubloon Haven. Doubloon Haven is a large city just outside of Cove Town, near center of the PirateCraft world (Live Map Link) This city is for pirates to rent a shop space to sell, buy or trade! There are 2 warps to get to this city, /warp shop and /warp shops, Warp shop will take you to the throne room that guides you through all the signs about the market, warp shops takes you direct to the map room, where you can quickly teleport to sub-markets around the marketplace, as you can see this isn’t your average square box marketplace with straight roads, None of it is designed in blocks or square plots. This city was picked because of the flow of natural sub-markets, slanty buildings, natural layout and different levelled terrain with room to expand and improve, it made it much harder to implement, but I’m sure you will agree that the hard work paid off with such a beautiful city. We created an automated server market to replace the player owned warps for shops we used to have a year ago to improve the economy on PirateCraft in a fair balanced, automated city, at present we opened with 76 player shops and 1 new rentable dock. How do I rent a shop? Renting a shop is really easy, you can either go to /warp shop and wander around the city to find something you like or you can do /as find. When exploring the city you will be notified in chat when a shop is available for rent, Left click the [For Rent] sign for that shops information, this will popup clickable options in chat, or right click the rent sign to instantly rent right then and there! If you don’t see a sign, you an also do /as rent. You can extend the rent of your rented shop by clicking your rented sign, or do /as me, click your rented shop and click extend for. Each shop has its own unique price, we created a spreadsheet that uses a basic algorithm to set the price of each shop based on the amount of blocks in the plot with some variables. The cost of all shops will fluctuate over time as we adjust the size of shops, add more, change spawn locations and adapt the algorithm that calculates the cost, we will be shortly releasing the spreadsheet (once its tidied up a bit!) to the public, so you can see how the shop costs are set. We also encourage everyone to also think of any improvements we could make to the calculation based on the data we have per shop to keep the shop rent prices balanced and automated. We have tried to create a high price for rent, This should help raise the cost of items on the server that have dropped from pirates low-balling, shop cost may dramatically change at a later date. How long can I rent a shop? Shops have their rent time set based on their size, the largest shops rent starts at 30 days at a time, then the next size down 2 weeks at a time, the smaller shops being rented at 7 days at a time, all of these can then have their rent extended forward up to 60 days max rent time. This means you can forward pay up to 60 days rent time at any time on any of these shops. Don’t worry you can keep paying forward rent as long as you are active! We also have some pop-up shops, the market stalls in the middle of the market, these are rented a day at a time for a maximum of 7 days, this allows for quick popup shops to sell a few things off fast! First of all, you will be notified at login if you rent is about to expire, so pay attention to warnings! You can also run /as me at any time which will list all your rented plots and time left on all of them, clicking the plot name in chat will bring up detailed information and options for that plot. If you let your rent expire then the shop will be completely reset back to its empty state, a blank shell ready for the next person to rent, this keeps the entire city automated and ticking over smoothly. How does un-renting work? will I get some money back? If at any point you wish to un-rent your plot you can do this one of two ways, you can left click your rent sign to bring up the in-game menu, from the chat click un-renting payback, or you can do /as unrent. After unrenting you will get some money back based on the time you have left rented, market stalls return 25% from time you have left, and all other shops return 45% of the time you have left. We have a teleport wall at /warp shops to quickly teleport you around the market to sub-markets, hopefully over time the build team will add in some sub-market spawn locations to create more teleport locations. We steered away from have /warp shop1 /warp shop2 /warp shop3 etc as this is a little confusing to new players, /warp shops has a big map with a key so they can see where each warp takes them! When you rent a shop, you get a teleport to it! You can use /as settp inside your shop plot to set where you want it to be set for you, so you can set this in your vault (your shop comes with an obsidian vault) So no entrance is needed to get your vault from your shop floor. This is also handy for moving items to your shop. You use /as tp s<no> to teleport to your shop, if you didn’t guess already s stands for shop, and the number if the number of your shop! Shops can’t be sieged, and every shop comes with a basic obsidian vault, feel free to change it as you please, some vaults go down lower, so you have more room to expand! Owning a shop isn’t cheap, shop owners will have to keep on top of rent to keep hold of their plots, having this luxury we aren’t too worried about people stashing item away in an unsiegable area, it won’t be much different to a properly secured vault as it stands. Why cant you /sethome in the market? This is to stop people setting home in your vault if they got in. New way to buy ships! This plot renting can be used for a range of purposes, I thought a great use would be for buying ready-made ships, The ship is already in the dock and you rent the dock for an hour, This gives you the opportunity to adjust it, Stuck ships will be able to be unstuck, This also gives the pirate some preparation time before they set sail. We have an amazingly beautiful new ship up for sale at the /warp shop docks, click on the docks sign to teleport you to the man’o’war for sale, it was built by the very talented Maximus_Terragon (minus the sails, I bodged those to get the ship working, calling Maximus_Terragon for some sail work). Since this is much easier to setup regenerating rentable regions I will be converting all the cove ship sales to this system of renting docks, and I will be able to setup locations around the map too, ae0 on your island? London market? get in contact people! We started off with this basic city as its a great canvas ready for personality to be added, this is why shops don’t come furnished and there are no blocks since 2012 in the city. We want to encourage everyone to make Doubloon Haven PirateCraft’s. Feel free to tear down your shop and start again. If anyone rebuilds better we do have an option to save your new updated build as the “default” shop, so if it ever regenerates then your better version will be the shop its updated to! The cove marketplace will pay you for your shop design if we want to use it, feel free to do this as a means of making money from the server, we will always pay you your rent back+bonus for using designs that we really like and implement into the city, we will have a forum thread for submitting “better shop designs”, these shells will need to be empty from shop signs and chests. City Builder and planners; Building new shops, expanding the city, updating walls, towers, roads making interactive fun areas or whatever ideas you have to improve the city, contact any of the RearAdmirals (orange usernames) to get added onto the Doubloon Haven City Building team, this will grant you build access across the whole of the city, but you wont be able to access any of the shops. You will also act as a helper to those that have shops that need that odd block changed that’s out of their reach! There will also be a forum post for applying for city build team too! You have a new tool to check if the block you hit is in a region or not, its a golden pickaxe, right clicking a golden pickaxe on a block will tell you if its part of a shop or not. 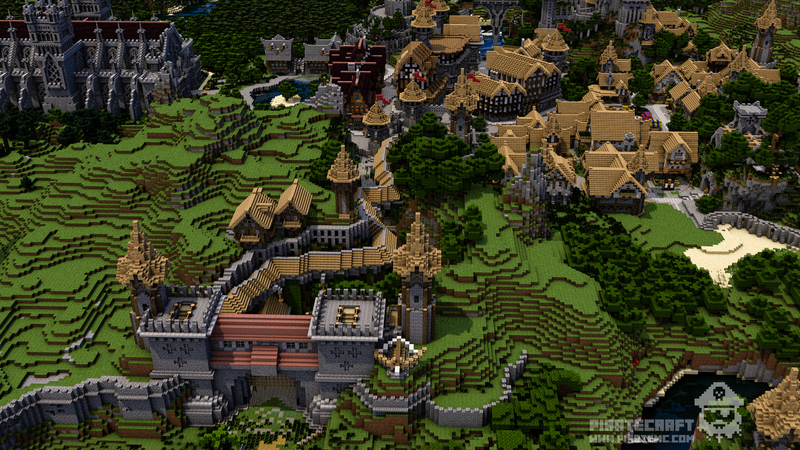 All shops will be part of the region “market” this is the master market region, all shops will be called s1, s10 etc. Please check out /as help in game to see all available commands, all of the renting can be accomplished by commands instead of using the rent signs. Some useful commands are /as rent, /as unrent, /as me and /as info. All the renting messages in chat are clickable, you can click the [shop] messages to save yourself trawling through commands and pages. This is possible, but its not activated at present, this is because the city is brand new, only released on Saturday 12th November 2016, we didn’t want the rich players buying all the big plots to then re-rent to other people at a higher price, were going to let the market settle a bit before we enable this, it will come at a later date to allow you to use as you please. At present you can only rent 1 shop at a time, same reason as above, the markets new, and we don’t want rich players owning the monopoly, this will change later once the market is more settled. What about buying plots that I can resell? This is another option we could enable later on, not in this city, but in a second or third city, where you actually buy and own the plot to then rent yourself to others, or sell. We haven’t fully thought through how this would work yet, but It would need to be its own separate market. Since each shop is its own WorldGuard claim, they all have flags set, what this means is there is a set of rules in shops restricting everyone that isn’t a member of that shop plot. At present all doors, levers, buttons, pressure plates, fences, trapdoors are all together in the same group, this is called an “interact” flag, there is no way to separate which ones we can enable, they come as a group (sadly). At present interact group is disabled while people setup shops, so you cant use a shop keepers doors, buttons etc. I think all of these should be enabled to allow shop keepers to be more creative with their shops! The only downside is that you cant have a button activated vault door. Teleporting into vaults should be an easy fix if we enable the use of interacting. Do reply below if you think its a good idea to enable all these interactions. Chests are separate; chests come with their own protection, at present they do not need a block on top to protect their contents. They are locked to all member of the shop region only. I think we should remove this protection once the city has settled, so lazy shop owners can be robbed and looted, it also means you can then use free chests in your shops to give items away. Since this world protection is new to PirateCraft we are keeping it on for a bit to make sure there are no easy ways to clean out a shop owner without them making mistakes. At present the entire market city is PVP free, this won’t be forever, PVP is disabled while we iron out any kinks, a lot of players are helping staff test out shops, we don’t want PVP to interfere with this yet, when we do turn PVP on, the main spawn building will still be entirely PVP free, and we will have PVP free spawn points for when teleporting around the market. We plan to expand this city, outside of the walls is planned to be more rural design. Plans have also been made for new markets to be built later on if this one is successful! We could use an old player city that doesn’t have a purpose to speed up development of building. Not all shop regions were created equal, quite a lot of them will need to be resized when you find that one annoying block you cant change! Make sure to use the Region checking tool (Golden Pickaxe) to check if the blocks in your shop region or not. We will have a thread out soon to request resize of your shop. Do take note that all shops will probably need making bigger, which means we will need to update the price spreadsheet and update all costs later. When creating this project our biggest worry was the existing player markets and how they would be effected by having an automated server market. Its very important to the community that these player owned markets stay open and still exist, this creates a balance of prices around the server and freedom for players to run their own markets. We have set the cost very high for renting at Doubloon Haven, meaning people will need to sell items at a much higher price to pay their rent on time. This is the cost of building next to a warp anyone can access at any time. The amazing player owned markets Ae0’s Island and London for example will still allow players to set any price they want without worrying about keeping up rent. It would be fantastic to build a nether rail to these connecting them to Doubloon Haven, or roads, if you dare! Hell we could setup trade routes with ships, I would also love for these owners to have input into the expansion and running of Doubloon Haven, you all have more experience running a marketplace than I do! Its got to be community run! I would also like to setup rentable ship docks at your markets if you are happy for that to happen to setup more buyable ships around the map. As with everything new, there are bugs that we have to squish, and they will be over time. Don’t ride horses into other peoples shops, this will get you kicked from the server, the horses are classed as “interact/use” the same as buttons and levers which is disabled at present, hopefully this will be fixed once we enable buttons/levers/doors etc. Some players have voiced the concern that the teleporting is without cooldown or warmup, this will be addressed by either the developer implementing a cooldown and warmup or I will add this if he does not. A few pirates have brought up beacons in the city, they think its an eyesore that distracts from the builds, I agree they do not fit in with the general design. tell me what you think in the comments, we can blacklist blocks if necessary. Chorus fruit has been mentioned as an issue from a few people, if you lock your chests (There already auto locked) there shouldn’t be a worry with someone getting into your vault. Not sure if this can be blocked with WorldGuard, more research is needed. There are no markers on the map? we will be adding markers for every shop and warp positions really soon! 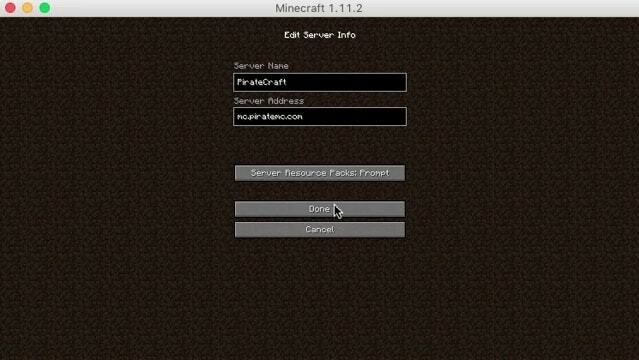 All shops will be auto hidden and main warps will be shown always on. Entity limiting, some players have voiced the concern that all this sign data, item frames and entities in one place can bog down coming to an area as this causes client lag for those that play on potatoes. We may need to research how to limit entities in WorldGuard claims, anyone know if this is possible? We have a bug with our “landlord” system, All money thats moved around from this renting and unrenting should be passed though a fake user that I injected into the server, it worked on the test server but not the live server, Not quite sure why this isnt working yet, the reason for this will be tracking all transactions and so you can see the total balance of all the money being spent on plots! The city was created by a builder called RoloFolo, all the way back in 2012 and its available for use in any project on his planetminecraft, so a giant thanks goes out to RoloFolo for creating this awesome city for us to start us off on our journey for creating PirateCraft doubloon haven. 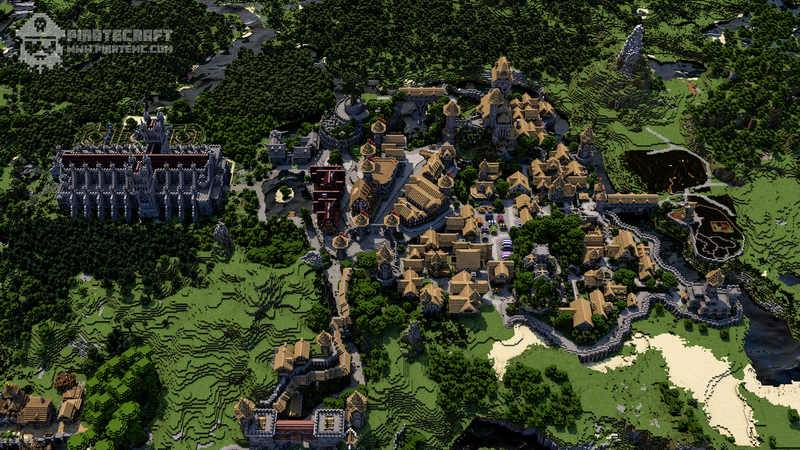 You can also find credit to RoloFolo and all staff by visiting the shop spawn and going to the very top of the castle, this project wouldn’t have been possible without everyone involved. Now because we had a head start, doesn’t mean this project was a walk in the park, oh hell no! This took much longer than expected to get live! It was so hard keeping this secret from even the rest of the staff and especially the community! The next city is going to be a community project! There has been blood, sweat and tears from all staff getting this city into PirateCraft and fitting it in perfectly with existing terrain, that feat alone was beyond magnificent, there is absolutely no way I could have done this without @calliemav @vapecloudbear @smokeyriver @iamthereaper89 @markusi13 true heroes and solid dedication, a giant thank you to all of you beautiful amazing people. This is also the team that has full control over the market, they can create new shops, change prices, resize shops, set market builders the works! 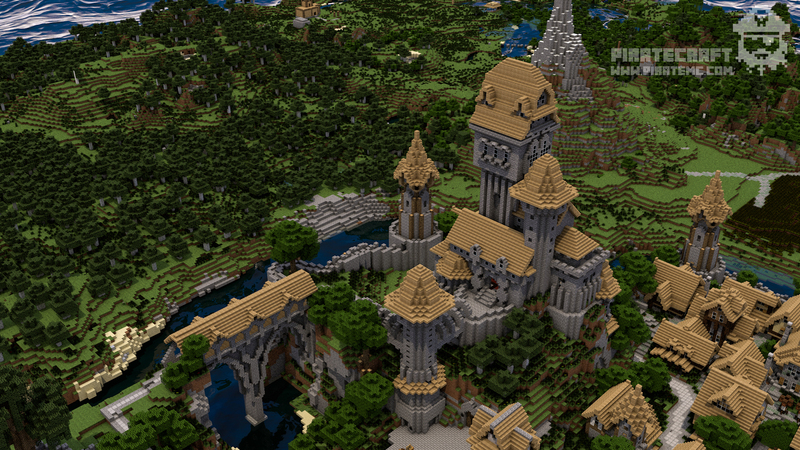 We also have @supergl to thank for all the beautiful renders you see on this blogpost! if you click the renders you will be able to get a high definition copy of the city to use as a wallpaper if you please! they are in 1920×1080! 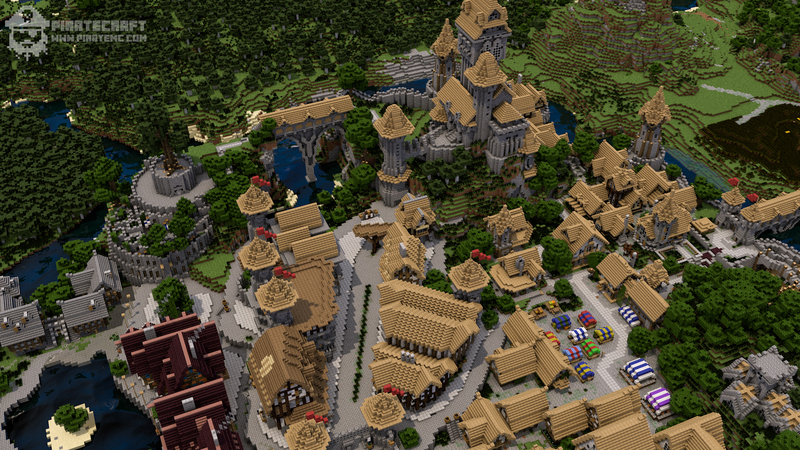 Maybe lets get some more renders done in 6 months time when every shop has been changed! Here is a Gallery of images from around Doubloon Haven from Saltpigeon. This topic contains 7 replies, has 4 voices, and was last updated by Cysteen 2 years, 5 months ago. This topic was modified 2 years, 5 months ago by GodsDead. Also I love the rent! It means lazy people who rented a shop will run out of money! So people actually have to work to keep their shop. This reply was modified 2 years, 5 months ago by Rivvur. Im not sure why that link wasn’t clickable, but I’ve fixed it, bloody automated posting to the forums didn’t work as it should have! May I request trade signs only? Personally I agree minecraft should be trade for trade, but people need to make money to pay rent. This reply was modified 2 years, 5 months ago by GodsDead. yes please. they are an absolute eyesore. trade for trade sounds fun and all, but money is more versatile and more widely used than items trade for trade. Chorus fruit has been mentioned as an issue from a few people, if you lock your chests (They’re already auto locked) there shouldn’t be a worry with someone getting into your vault. Not sure if this can be blocked with WorldGuard, more research is needed. for now I don’t mind it as much, it will only become a royal pain in the barnacles when pvp is enabled, if someone is able to chorus into a shop and kill you while youre restocking… I certainly hope there is a way to toggle it!! out of curiosity, would pearls and chorus be in the same “flag”?